2. From the panel on the left-hand side of the homescreen, select Financial Resources, then click CARD. 3. A new window should open up. The title should be, "Search CARD Entries." From here you can look at the status of any cards that have been entered. To change the status searching, check or uncheck the appropriate box at the top of the page. 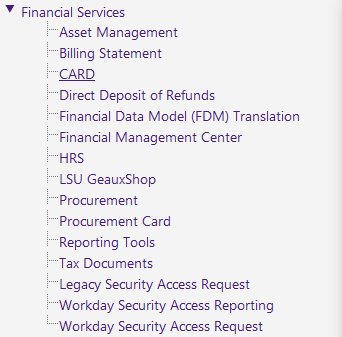 The user can search by PAWS/ LSU ID, Entry number, Initial Date, or Last Date. After typing in the appropriate information, click Search.